I couldn't say that I like going to the barbers anymore. Once upon a time, yes. Now, as middle age approaches, or rather quickly hurtles past, it's not nearly so much fun. 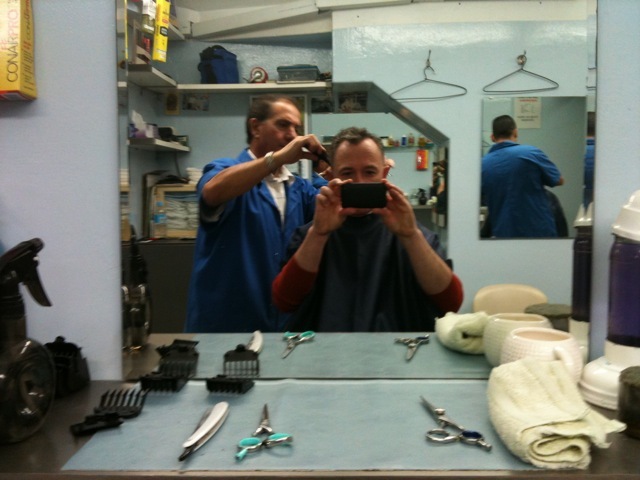 Sitting in front of a big mirror looking at my receding hairline and watching greying clippings fall to the floor isn't quite like sitting in front of a big mirror having black hair bleached white and cut into the latest 80s crop is it? Ah me, oh my. Even the back of my neck looked wrinkled today. 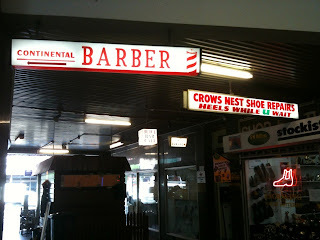 However, I am fascinated by going to the barber these days, ever since I discovered the Continental Barber in Crows Nest. Hidden in an arcade which was obviously built with great optimism in better days but which is now a sad thoroughfare through which you can hear ghostly winds and see the tumbleweed blowing, the Continental Barber lights up the dim interior with its neon sign. Alongside is a similar sign advertising Shoe Repairs and Heels While U Wait - it's that sort of an arcade. 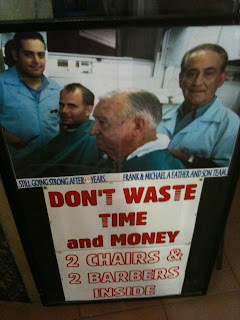 In the window of the Continental Barber hangs a sign along with a photo of the two Continental Barbers themselves, busy with some customers. It urges you not to waste time and money - they have two chairs and two barbers inside...Still going strong after 44 years (the number is changed by hand as the years tick by). Frank & Michael - a father and son team. To be honest, they are doing themselves down here...Very frequently I turn up at the tiny Continental Barbers to find not two but three barbers busy cutting hair. 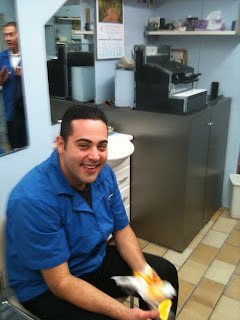 Frank, the father, is usually squished against the back wall with barely room to move around his customer. Michael, the son and the most popular and in demand, is always at the window. It is for him that people often wait, rather than taking the first empty chair. In the middle you never know who'll you get - an ever-varying cast of (usually) elderly barbers seem to rotate the chair. Today, I got someone I have never seen before. Although the shop was empty Michael was busy eating his breakfast and his father, it turned out, is on holiday for a grand nine weeks, back home in Calabria. He fell off a ladder recently and I think needs time to recuperate (and to stretch out those elbows a little). Here is Michael - unfailingly polite and charming although I do wish he wouldn't ask at the end of each haircut whether I'd like my eyebrows trimmed. Do they really need it? Good grief. Behind him you can spot the old-style till they still use to bank all their riches. A haircut used to cost a mere $18 which made tipping easy - I'd just hand over a twenty dollar note and tell them to keep the change (ooooh, how generous you're scoffing. But you'd be surprised how many people I watched take their two dollars back). Today however the haircut cost $20 which threw me completely. I had no change and had to leave them tipless. $20 is still ludicrously cheap. 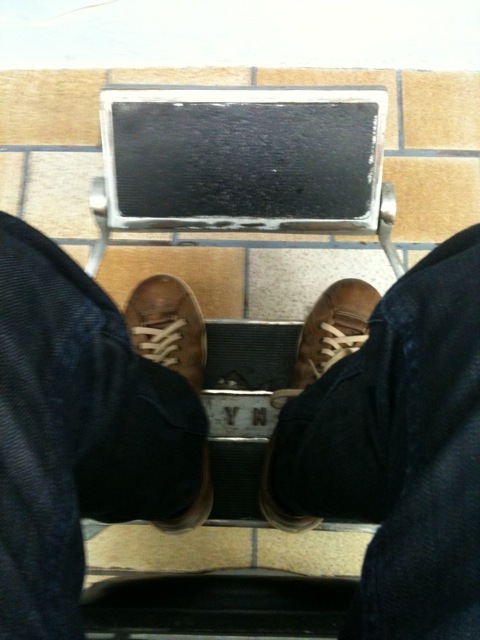 Back in London nearly three years ago my barber cost at least twenty pounds. And despite the rapidly falling pound and the ever strengthening dollar this is still not comparable. These are not things you can buy in a shop. Frankly, they are not things you would want to buy at all. In particular, there is an old bottle, dimpled in the middle as if to imitate the curves of a woman's body, containing a discoloured oily liquid which looks as if Frank was given it by his father back in 1932. The label is indecipherable from a distance and I've always been too timid to ask to take a closer look. Perhaps it is one of those mysterious things offered for use only "at the weekend"...Next to it is something sprayable in a blue and white cannister which looks as if its meant for the car not your head. Ear and nose trimmers dangle down from the shelves - presumably for sale. Frank or Michael always ask at the end of a haircut if I would like any wax or gel. Not recognising any of their products as being something that has safely passed animal testing regulations, I always decline. The anonymous white bottles have tropical sunset labels on them as if they'll magic you away to some island paradise but I've smelt the contents on other people and the effect is more Essex than Tahiti. Having your hair cut is a strangely intimate thing, with some stranger looming over you able to peer into your ears and to fuss about with your collar, their armpits frequently in your face. 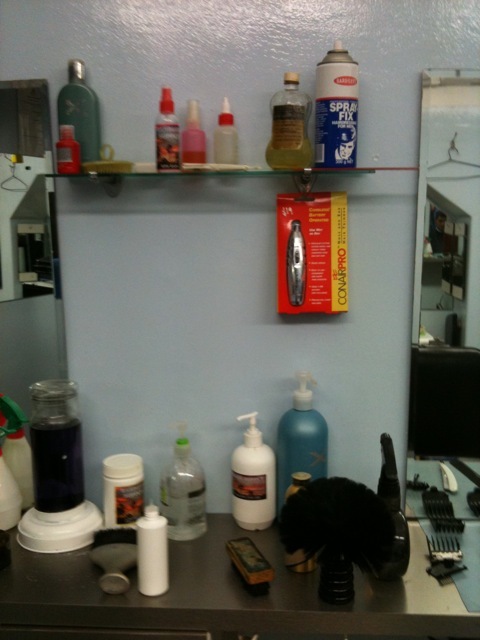 This enforced intimacy creates an atmosphere at the Continental Barber which resembles that found inside a church rather than a shop. Customers are more often than not completely silent (perhaps busy praying that that cut-throat razor doesn't slip) and neither Frank nor Michael seem to initiate conversations. If you begin talking they are always more than happy to chat back but they have obviously, with their 44 years of experience, learned that silence is the way to go. They certainly never seem to have a conversation amongst themselves which makes me think there must be an unwritten rule between them not to. Often the entire place is full, all three chairs busy, and no-one is saying a word. I'm intimidated into silence too. To pass the time I'll flick glances over at the other customers to see if they look as ugly as I do with only their heads visible poking out of a synthetic black sheet and their hair mercilessly slicked forwards to one side or the other. Thankfully I always discover it's not a good look for anyone. Eyebrows - huh, Wait til it's your nasal and auditory hair that needs a trim & blow wave! Hey I've never been to this Barber but this was a good read in the future I expect to see even better and greater posts at your blog, thanks!